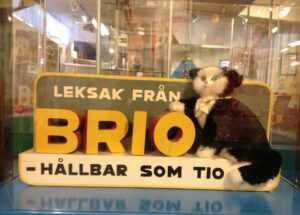 Let Toys Be Toys has been awarded the BRIO Prize in a ceremony at the Swedish company’s headquarters in Malmö. 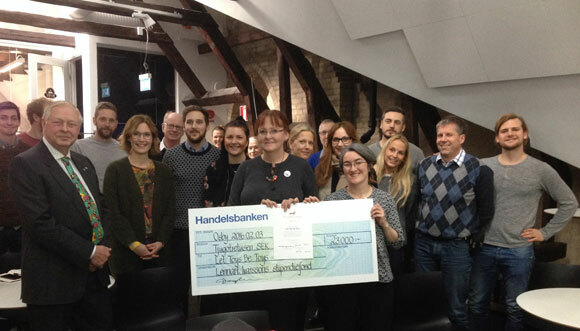 Our campaigners Jess Day and Tricia Lowther travelled to Sweden to pick up the award on behalf of Let Toys Be Toys. Tricia writes here about their day as guests of BRIO and what winning the award means for the campaign. We were surprised and delighted to be awarded the BRIO Prize and excited to be invited to attend a prize giving ceremony in Sweden at the BRIO company headquarters. The Lennart Ivarsson Scholarship Foundation, which awards the prize, was set up to promote scientific research and development linked to children and toys. The BRIO Prize has been awarded annually since 1992 to either a distinguished academic toy researcher, or to a non-profit organization working for the benefit and development of children and young people. 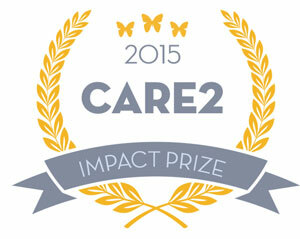 It’s a real honour to be recognised alongside eminent academics and charities doing such great work. In my experience when you mention BRIO to anyone in the UK they immediately think of trains, so it was interesting to visit Lekoseum, a toy museum in the town of Osby where BRIO was once based, and see the range of products associated with the company. Dag Ivarsson, great-grandson of the company’s founder, was one of those who met with us and it was interesting to hear about the company history from someone so closely connected to its origins. As parent to a child who is obsessed by all things feline I was particularly taken with the BRIO cat, which was sat next to an old sign that tells customers a BRIO toy has ten lives. In the downstairs part of the museum old equipment from the days when production took place in Sweden has been re-used to furnish a Santa’s workshop. We both wished we had our children with us to see this. It was also quite poignant to see a frame containing the last ever piece of BRIO train track made in Sweden. Nowadays, while design and other operations take place in Malmö, most of the production has moved to factories in China. After much food for thought we were treated to food for mouths – with coffee and ‘Semla’, a traditional Swedish bun that not only has a delicious almond paste filling but is also topped with whipped cream. Apparently, in the eighteenth century a Swedish king collapsed and died after eating a large meal followed by fourteen servings of Semla! After our delicious one serving, we had pictures taken by a local press photographer and then popped into the museum shop where we were encouraged to offer advice on layout! 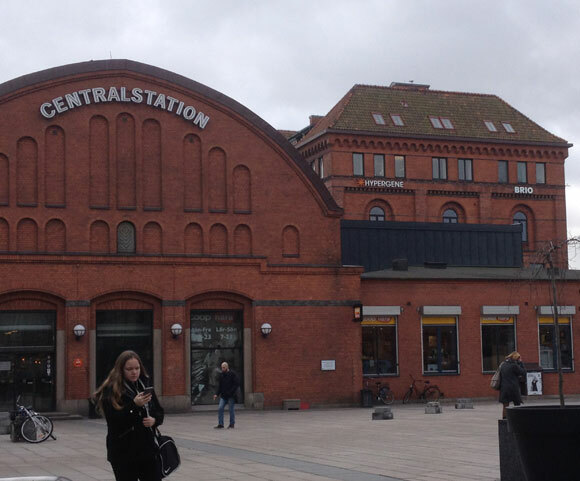 We returned to Malmö to visit BRIO headquarters, which moved there in 2007 and is based, where else, but above Malmö central station? They have fantastic views of train tracks and scenery from the windows, I wonder where they get their ideas from? After lunch Dag Ivarsson gave a talk and presented us with the award. We then gave a talk to BRIO staff about the Let Toys Be Toys campaign; how and why we began, what we have achieved and how the conversation on toys and marketing has changed since our launch at the end of 2012. Apparently this meant it was then time for more cake! We also heard a talk by Michael Heun, Head of Development and Operations at BRIO. Michael spoke, not just about BRIO, but about how toy marketing is changing, especially in light of recent challenges from people like us who think it’s wrong to push gender stereotypes onto children. Michael praised the campaign for the impact it has had on trends in the toy industry. It does seem that many in the industry are beginning to realise that consumers are increasingly uncomfortable with marketing that relies on limiting stereotypes about boys and girls. BRIO is a great example of a company that markets and packages toys in an inclusive way that puts children’s learning and fun first. We told the people at BRIO that our campaign is led by our supporters, that we just tapped into the frustration that was already there at an industry that has often chased profit without regard to what gender stereotypes mean for the well being of children. We received this award because of everyone who has supported us and helped in any way to spread the word about the issues. Through the power of social media and the passionate support of so many we’ve been able to achieve a lot on next to no budget. We have some ideas about possible research the prize money could allow us to invest in, but if you have ideas or suggestions let us know through the usual channels; leave a comment, facebook, tweet or email us. Over dinner there was some interesting discussion about the ways countries across the world market to their children. Sweden has a reputation as one of the world’s more advanced countries when it comes to gender equality, so it’s no surprise that toy retailers over there appear not to have reached the depths that some of our own have done, in terms of the way children have been blatantly targeted on the basis of ridiculous stereotypes. We were really impressed with Swedish hospitality but more importantly it means a lot to the campaign to be recognised in this way from inside the industry that we’re trying to influence. There are hopeful signs coming from within the toy industry at the moment. Some companies at least are ready to accept that it’s not necessary to find out whether a child is male or female to find out what they are interested in. What a wonderful achievement. I’ve only recently discovered your website and you’ve already given me a lot to think about regarding the way I market toys. Theme rather than gender makes a lot of sense. Thank you, and keep up the good work.